This entry was posted in Free Downloads, Questions Answered, Sustainable Beekeeping and tagged beehive, diy beehive, natural beekeeping, Top Bar Hive, Warre Hive. Bookmark the permalink. It’s good. Very informative from a beginner’s perspective. This next spring I am going to start 3 warre hives with nucs of five frames ea., of russian bees. Do I start them with 4 boxes or 2 Boxes and do I put the nucs in the top box or the bottom Box? Can’t get to the guide! I’m excited to read it when it is available. 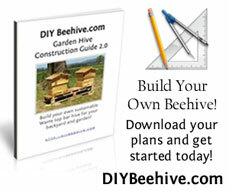 I purchased your guide to Warre hive building some time ago and now have 2 hives, each with 3 boxes. As a novice, I am keen to read your Quick Start Guide. Sadly when I go to download, the page tells me that the site is not there yet and I should check back in a couple of weeks. Clearly some people have successfully managed to download. Can you advise? The season is fast coming when I can procure the bees, and I am anxious to get started. Nick, NICE job on the guide. As always, you make it simple and that’s wonderful. I especially like the photographs. Explaining it is one thing, SEEING it is what we all need. Many thanks! I come from a similar langstroth background and am currently preparing for my all natural transition into top-bar hives. I was wondering what your take was on the screened bottom board as an IPM approach. True, bees do best when left alone, but we humans alter everything else outside of the hive (i.e. shipping hives and pests) so i feel this is an important addition to any system. Do all/most warre hive bodies support a max of 8 topbars? Can a beekeeper use a standard langstroth design but replace frames with topbars and honey supers with cloth and insulation? I am currently working with a company called BaltimoreHoney.org, on a hybrid-hive that combines a Kenya topbar system with that of the langstroth supers and Warre hive. Please let me know if you have any comments or suggestions, thank you and bee well! Hi Nathan, I think a screened bottom board is a great addition to any beekeepers arsenal for pest management. When we put bees in a box and keep them, then we have to take some responsibility in keeping them safe from robbers, pest, disease, etc… I’m working on a plan for a SBB as an addition to my plans here that I hope to have finished soon. Yes the majority of Warre hives use 8 top bars, as for the reason why it has to do with the volume of space in a hive box. Check Beekeeping For All (link is in the sidebar) right around page 38 for a more thorough explanation. I keep mine evenly spaced by attaching the bars with a finish nail then prying the top bar up. It creates something of a placement dowel for me. Cross and burr comb is always a problem, you can use half frames in a Warre to help them build straighter comb and it lets you work a Warre like a Langstroth. In fact if you live in an area that requires inspection then half frames must be used. Nick, you mention half frames, would that be a wax frame cut in half and fitted into the top bar? I have been informed that my state requires inspection but I’ve never heard of any urban hives being inspected here. Never heard the mention of half frames before.